The Sun, our star, is heart of the Solar System. The Sun is an average star, called a yellow dwarf. It looks small in the sky; however it is a giant gaseous ball consisting of 94% hydrogen and 6% helium. The Sun has a diameter about 110 times Earth's and a mass 330,000 times greater. Without the sun's powerful rays, life would not exist on Earth. In fact, the sun is the main source of energy for the Earth. This light energy travels to Earth in about 8 minutes and 20 seconds. The Sun shines due to the energy produced in its core through a reaction called nuclear fusion which requires extreme heat and pressure. The Sun temperatures reach 16 million degrees Kelvin and the pressure is so high that nuclear fusion is possible. In this process energy is released when four hydrogen nuclei fuse together to form one helium atom. It takes thousands of years for this energy to reach the surface of the sun and to be emitted into space. Above the core is the radioactive zone, where the energy from nuclear fusion is transported up by photons (small energy packets similar to elementary particles such as electrons). The upper layer of the Sun's interior is called a convective zone because this is where convection takes place in a process similar to convection in the Earth's mantle. Huge hot gaseous bubbles rise and transport the energy up, while the cooler ones travel down. The visible part of the Sun surface is called the photosphere. Of course, it is not a solid surface; it is simply the bottom layer of the Sun's atmosphere. It is still very hot, about 5,840 K. If you photographed the photosphere it would appear to be covered with rice grains, called granules. These granules actually are the tops of convective bubbles that carry the energy upwards. Each is about 1,000 km. wide. Sunspots are formed when the magnetic field of the sun gets twisted and pokes up through the surface. The Sun's magnetic field is so strong that it suppresses the energy flow through the spots and lowers the temperature. This makes sunspots look darker. Sun spots typically form in groups. Studying the motion of the sunspots shows that the Sun rotates faster around equator, about 29 day, and slower near the poles, about 31 days. The solar corona spreads above the photosphere up to 6 solar radii. The temperature rises again and reaches about million degrees. However, the solar corona is less dense, so it shines with less intensity then the photosphere. The only way to see solar corona is during the time of a total solar eclipse, when the moon is between the Earth and the Sun. Since the Moon is about the same visible size as the Sun, during an eclipse the moon covers the sun completely and blocks the majority of solar light, allowing a magnificent view of the solar corona and solar prominences. Solar prominences are spectacular feature in the solar corona. They look like bright loops and arcs because they contain hot gasses that follow the curved lines of Sun's magnetic field. Solar prominences can loop hundreds of thousands of miles into space. Astronomers study the Sun with specially constructed telescopes. However, the Earth's atmosphere blocks the damaging high energy rays from the Sun. If we want to study them we have to use spacecraft. Early observations were made from the first space station, Skylab, in 1970. The main purpose of Ulysses spacecraft was to study magnetic field of the sun. The Solar & Heliospheric Observatory (SOHO), an international collaboration between the European Space Association and NASA was launched in 1995 to study the Sun from its deep core to the outer corona and the solar wind. Every minute the Sun looses 4 million tons of its mass because of nuclear fusion! However, it has enough supplies to shine at least 5 billion years. This lost mass turns into energy. The visible light is only part of the energy emitted from the sun. The Earth receives less than half of one billionth of this energy. The Sun has an average 11-year cycle of activity. During solar minimum, there are very few sunspots, and during solar maximum there are many. The last solar maximum was in 2000, and the next one will occur sometime during 2011 or 2012. Beside the sunspots, the number of solar flares and prominences also raises during the peak of the Solar Cycle. Solar flares are the most powerful expression of the Solar Activity. They are giant bursts in the solar corona, equivalent to explosion of thousands of bombs. The eruptions are so strong that the ejected material and highly energetic electromagnetic waves (X-rays and UV light) reach the Earth and beyond. One of the main goals of the SOHO's mission was to monitor solar flares, because they strongly influence the Earth's atmosphere. Their highly energetic particles not only cause the spectacular polar lights, but could be quite dangerous for the astronauts in the space stations. They also cause magnetic storms that disturb satellite communication. A type of star with surface temperatures between 5,300 and 6,000 K. When a yellow dwarf exhausts all of its hydrogen supply, it will become a red giant. The process by which the nuclei of two atoms fuse together to form a heavier element; large amounts of energy are produced by this fusion. A unit of measure for temperature. A temperature of 0 K is equal to -273.15° C and -459.67° F.
310.95 Kelvins is equal to 100° F and 37.8° C.
The core of an atom, which contains its protons and neutrons. A unit of light intensity, or a quantum when referring to electromagnetic radiation. A negatively charged particle that partially comprises an atom. The process of heat transfer in a gas or a liquid through the circulation of hotter material from a warmer area to a cooler one. 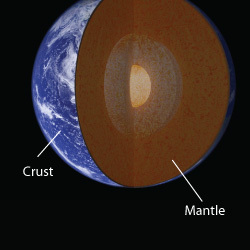 The layer between Earth's rocky crust and it's molten inner core. The upper atmosphere of the Sun, visible during a total Solar eclipse. 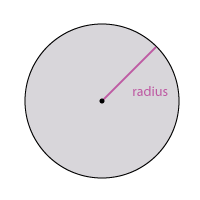 A line segment that extends from the center of a circle or sphere to its perimeter. Large plumes of plasma emitted from the Sun's surface, which extend into the Sun's corona before looping back. NASA's first space station, launched into Earth orbit on May 14, 1973. It functioned as a laboratory and short-term living quarters for three different teams of astronauts, before prematurely reentering Earth's atmosphere in 1979. Though most of Skylab burned up upon re-entry, some pieces survived and scattered through parts of Australia and the Indian Ocean. A joint project by NASA and ESA, the probe was launched in 1990 to study the Sun's magnetic field. Communications with the spacecraft were terminated in 2009. An ESA spacecraft launched in 1995, tasked with the study of the outer layer of the Sun. The European Space Agency, founded in 1975 and headquartered in Paris, France. The National Aeronautics and Space Administration, headquartered in Washington D.C. Founded in 1958, the American space agency has been responsible for a number of remarkable breakthroughs in aeronautics and space exploration.